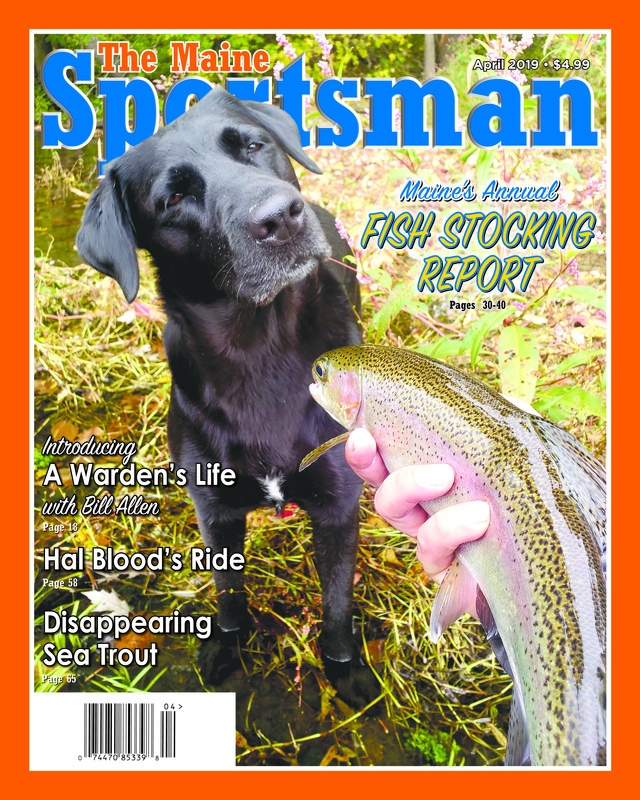 Fish Stocking List, Maine’s World Champion Archer, UTVs and a Bit of April Fun! 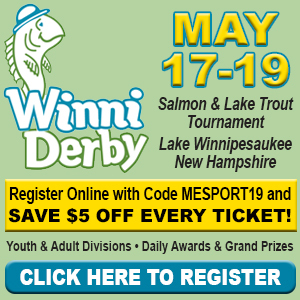 Each year, IF&W stocks hundreds of thousands of brook trout, rainbow trout, lake trout, brown trout, landlocked salmon and splake in Maine lakes, ponds, rivers and streams. So how do you find those fish? 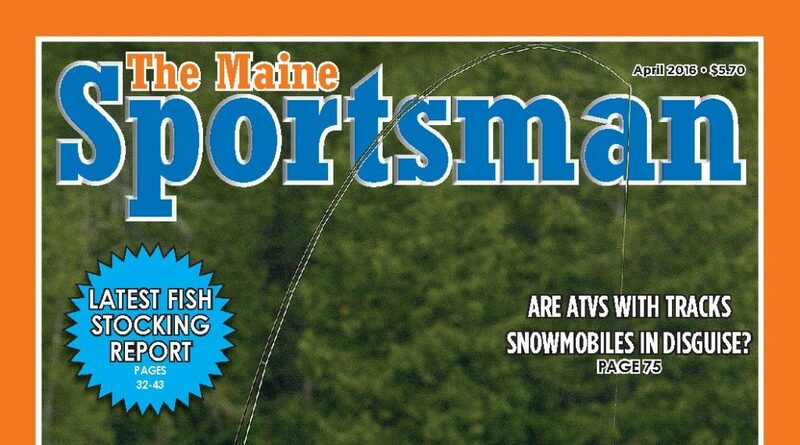 By referring to the twelve full pages in the April issue of The Maine Sportsman, that’s how! The easy-to-read charts are organized by county and town, and reveal the specific water, the species of fish, how many were released, how big they were and the date they were stocked. The State goes to all the trouble of raising and placing these fish (some as long as 20 inches) – the least we can do is to take our family and friends and go find them! Hang on to the April issue, and use it as a resource all year ’round. 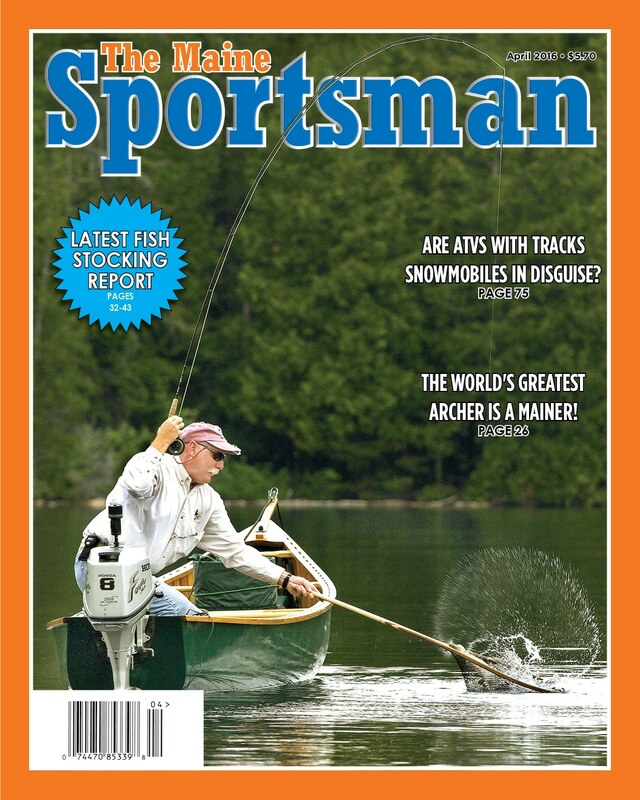 And if the stocking list isn’t enough to get you thinking about spring and summer angling, the fantastic cover photo should do the job – John Patriquin netting a monster brookie, which flipped its tail and sent a halo of Pierce Pond water into the air at just the right time for the moment to be captured by photographer John Ewing. Did you know Maine is the home of the world’s best archer with a compound bow? You’ll get to meet him in the April issue, thanks to Chris Johnson’s bowhunting column, titled “Maine’s Greatest Athlete You’ve Never Heard Of.” In competition, Dave Cousins has hit the bullseye 72 consecutive times, from 50 meters (about 150 feet) away, one of the many feats that earned him the National Archery Association’s “Shooter of the Year” honors – eleven years in a row! Johnson’s two-part feature on Cousins will conclude in the May issue. J.P. Falzone and Cathy Genthner weigh in with two perspectives on side-by-sides, also known as UTVs (utility task vehicles). When equipped with tracks, these machines meet the current legal definition of snowmobile. Some folks aren’t too happy with that, and want that definition changed. They are also concerned that some UTVs being sold these days are wider than 60 inches, meaning they don’t fit through standard gates or bridge openings on snowmobile trails. Clubs are conflicted in the debate, since many of them use UTVs for trail grooming. Look for more on the topic from both writers in May. and Lou Zambello contributes two items to the “Almanac” which our fact-checkers have not yet verified; namely, eyewitness reports of fish-eating moose and freshwater stripers. Jim Andrews waxes eloquent about DeLorme’s Maine Atlas and Gazetteer and the risk to its continuance following purchase of the company by Garmin, a theme we mirror in the editorial; Ethan Emerson, Joe Saltalamachia, Steve Vose and George Smith all look forward to wild turkey season; Luke Giampetruzzi, our youngest rising star, covers fly-tying; King Montgomery provides an ode to toothy pike and pickerel; and several writers celebrate the open-water season, which IF&W gifted to us two weeks earlier than usual this spring due to the mild winter. Keep supporting our great advertisers who help bring these issues to you, including LandVest, CWA & Lake St. real estate in Lincoln; Sepaq Anticosti, Giguere Auction Co., Brecks lures (Lake Clear Wabblers and Mooselook Wobblers); LL Cote, in New Hampshire and our friends at Whittemore & Sons in Skowhegan. Moose lottery application deadlines are fast approaching. Paper applications must be postmarked by April 1, 2016 or received at IF&W’s Augusta office before 5 p.m. on that date. Online applications (see https://www5.informe.org/online/moose/) can be submitted for 6 weeks afterwards, but must be received by 11:59 p.m. on May 16, 2016. Make plans now to attend the Maine Sportsman’s Show, jointly organized by The Maine Sportsman magazine and Sportsman’s Alliance of Maine, April 1st, 2nd and 3rd at the Augusta Civic Center. See you there!